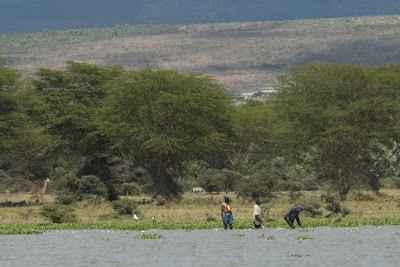 One of the places we visited was Lake Naivasha. 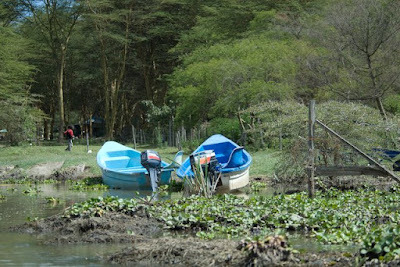 We took a short boat trip out on the lake to see some hippos. The hippos turned out to be the least photogenic feature of the boat ride - they were mostly submerged under water with just a small bit of their head sticking out. 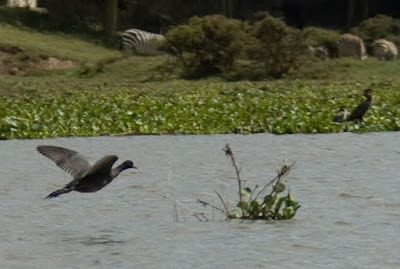 But, there was a great number of other wildlife in and around the lake. This is what the boat we used looked like. And this is a bachelor hippo hanging out in water. One interesting fact about bachelor hippos - they are very protective of their space. 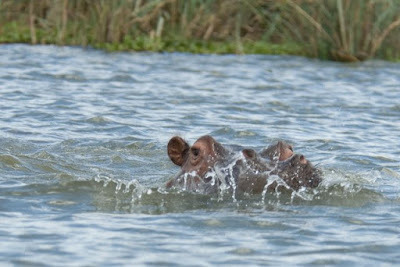 This same hippo is now charging our boat because we were getting a bit too close to his territorial waters. This caused a bit of uneasiness amongst the people in the boat as the boat seemed like it could be quite easily flipped if bumped by a hippo. 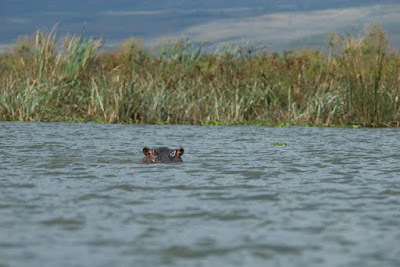 I asked the guide if he'd ever had his boat flipped by a hippo and he said no, but some members of our group remained unconvinced and were rather nervous for the rest of the boat ride. 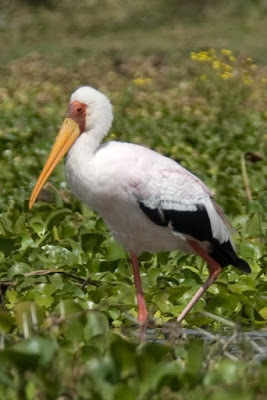 This is a a yellow-billed stork that was hanging out on the shore. And here are a group of men who were fishing with a large net. I liked this picture because there's a giraffe and a zebra in the background. 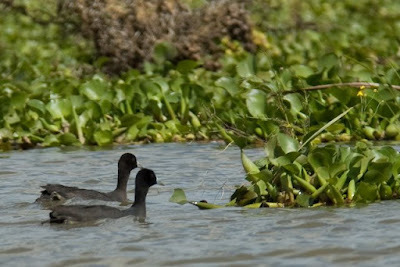 It's a good illustration of just how plentiful the wildlife are in this lake area. 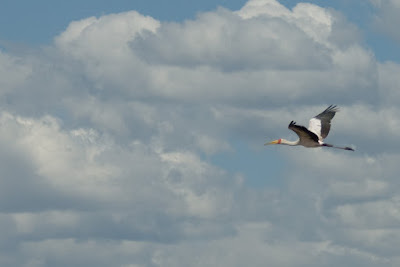 Here are a few more pictures of some yellow-billed stork which were flying overhead. 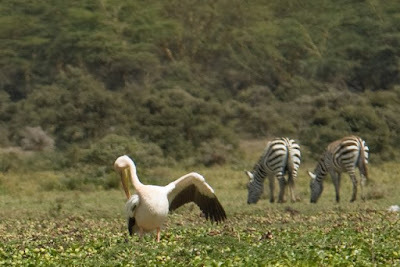 This is a great white pelican, with a couple of zebra in the background. 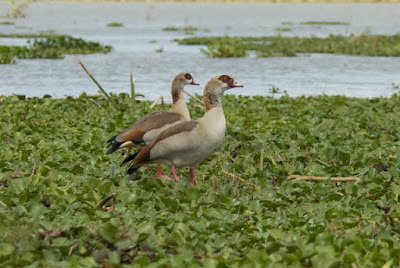 I don't know what these two birds are - they don't seem to appear in my Wildlife of East Africa book. 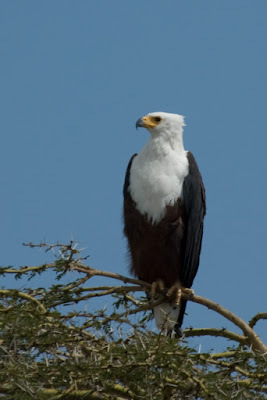 This is an African fish eagle. 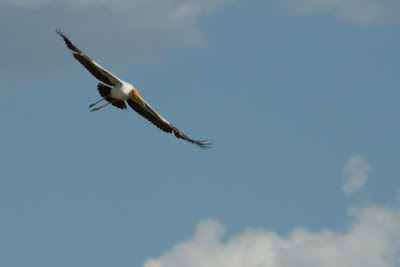 It looks quite a bit like an American bald eagle, but the white covers more than just its head. 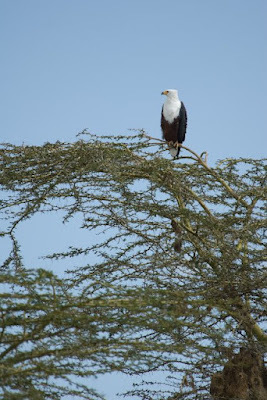 The tree the eagle is on is one of the thorny varieties with two-inch long spikes. 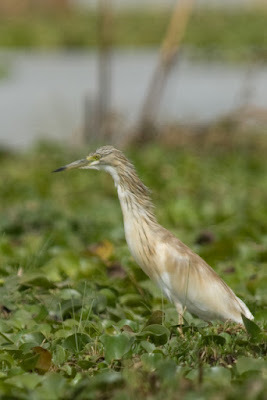 This little guy is a squacco heron. 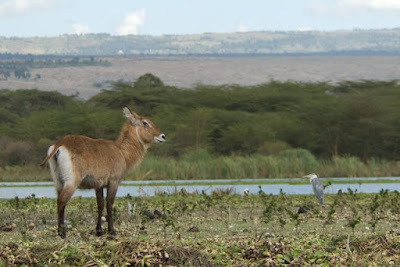 The is a Defasssa waterbuck and in the background is a grey heron. 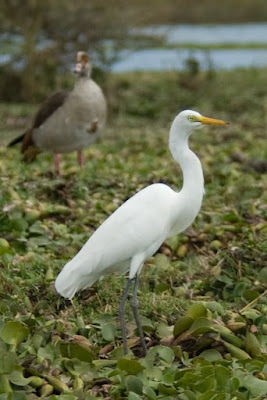 Here's a great egret with Egyptian goose in the background. 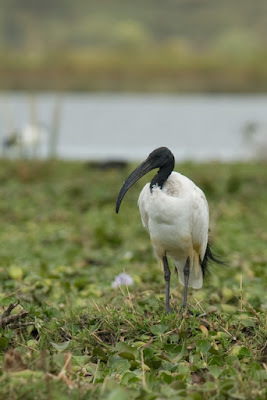 This funky looking bird is called a sacred ibis. 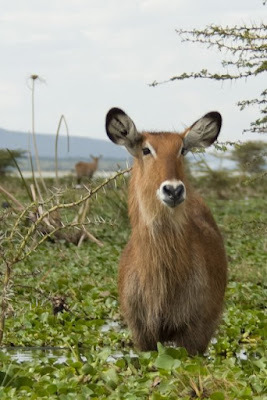 Here's a waterbuck up close. 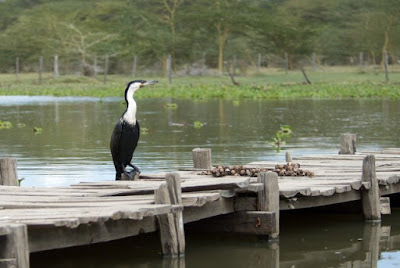 And finally, hanging out on the dock when we got back was a great cormorant. It looks a lot like the cormorants were have at the ocean here in Rhode Island. Just the coloring seems different. 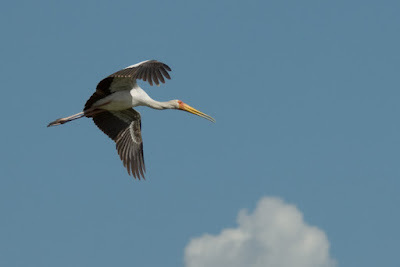 It was amazing the amount of diversity in wildlife that could be seen on just a 50 minute boat ride. As usual, you can click on any of the above images to get a slightly larger view. I was cleaning my condo today, sorting through stuff in boxes that had long been stored away from my last move, when I came across an old journal. 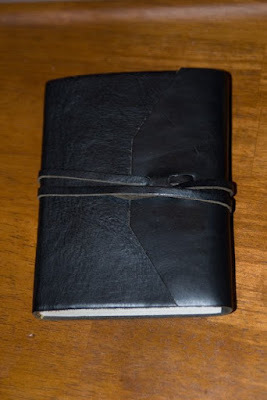 Back in the year 2000, I had bought a handy little blank leather-bound journal. I had intended to start keeping track of my thoughts, but I mainly bought it because I liked the way it looked. It has an oversized flap that wraps over the cover when closed, along with a leather cord long enough to wrap around the book several times. The long leather cord is totally unnecessary - it's not like the contents of the book are going to be struggling to get out - but still, there was something about it which I liked. After I bought it, the journal sat on a shelf unused for probably six months or so. Then in July of 2000 the journal finally got some use. I had recently met a woman I fell head over heals for and I started writing all sorts of crazy stuff. I say I wrote "crazy stuff" because reading it now that's how I can best describe it. I was totally out of balance - apparently every thought I had revolved around this new woman in my life. As a result, I did manage to write some decent love poetry - I suppose there's something to be said for having a muse - but still it definitely wasn't healthy. It's easy for me to say that now, but at the time, I was totally delusional and thought I was acting quite reasonably. I was completely convinced that there was true love and I had found it. And this made it all the harder for me to cope with when the relationship came to an abrupt crashing end. I suddenly had to live with the reality that what I most firmly believed in and had tried to focus my life around was actually imaginary. "I still look back fondly on my memories with her but realize our parting was for the best. I depended too much on her for my happiness, made her my reason for being, thought that true love existed and that there was some grand meaning to it all. I was delusional. Sure, I was happy with her, but having now spent two years alone, I realize I am a better person on my own; I'm more balanced and introspective. I am at peace with life and I am enjoying it all." And this brings up the point of what I'm trying to get at now. From reading stuff I wrote several years ago, I can easily distinguish between what appears to be "balanced" thinking and what appears to be "delusional". But, it would be so much better if I could actually do that with thoughts in the present. What things am I doing now that seem to make perfect sense but years from now will make me cringe and say, "What the heck was I thinking?" 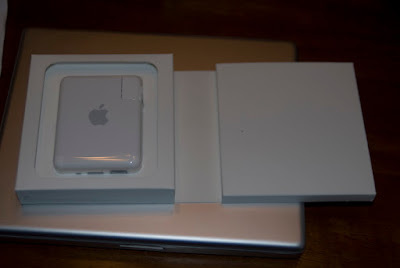 I just recently bought an Apple Airport Express. As is true with just about all of Apple's products, this thing is cool from a gadget point of view. 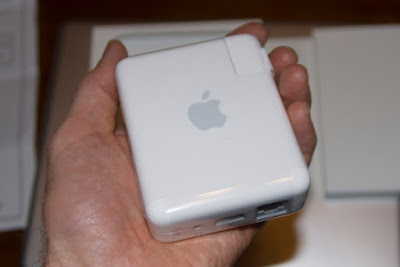 And for something that provides wireless access at 802.11n speeds, it is tiny! To install it, you just plug the thing into an electrical outlet, hook up an ethernet cable from your router, and run a simple utility on the Mac or PC. 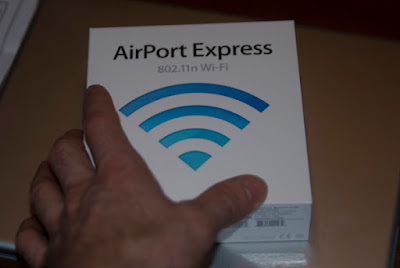 If you already have a wireless network, the utility will detect that and offer to configure the Airport as an extension of that network, or function as a new 5Ghz only 802.11n network. It will also easily learn the wired portion of the network configuration and the Airport Express can coexist with another wireless router. So, I basically just plugged it in, answered a few questions, and it was up and running. The main feature I like about it (other than acting as an 802.11n wireless access point) is it also has a headphone / mini digital audio (fiber) connector, so I can connect it directly to my stereo and pipe iTunes music to it ! Once it's configured, iTunes has an added button on the bottom of the screen to select where the music is to be played - either on the Mac or on the Airport, or both. So, regardless of where my laptop is, I can have it piping music wirelessly to my stereo. It also has a USB port for adding wireless printing support to a printer, but I haven't tried that feature and doubt I will. 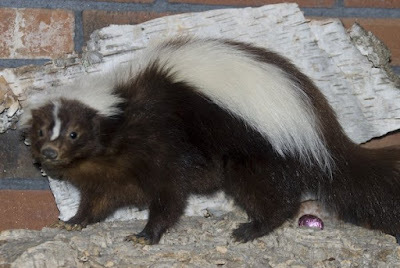 Here's photographic proof that there is in fact an Easter Skunk. He was caught in the act of "dropping" one of those foil covered chocolate eggs. If you ask me, I think it makes a lot more sense than some bunny carrying a basket full of eggs. Now this is a lot of snow! On Easter weekend I went up to New Hampshire with a few friends. 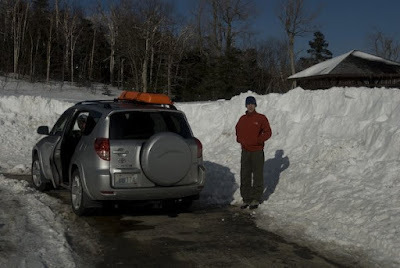 While there hasn't been a trace of snow on the ground around home, there's still plenty up in New Hampshire. Apparently this year had record snowfall up north. 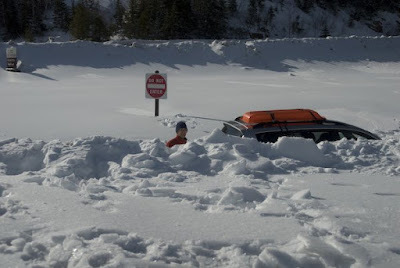 I found it amazing that I could drive just 3 hours and go from no snow to over three feet on the ground.